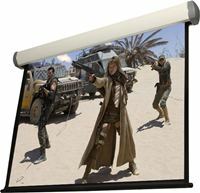 EXZEN's motorized electric projector screen comes with its built-in RF receiver inside the tubular motor. It can be operated either with wireless wall mount switch or hand-held remote controller. The slate liner can be replaced with other colors with ease. High quality Matt White screen fabric.